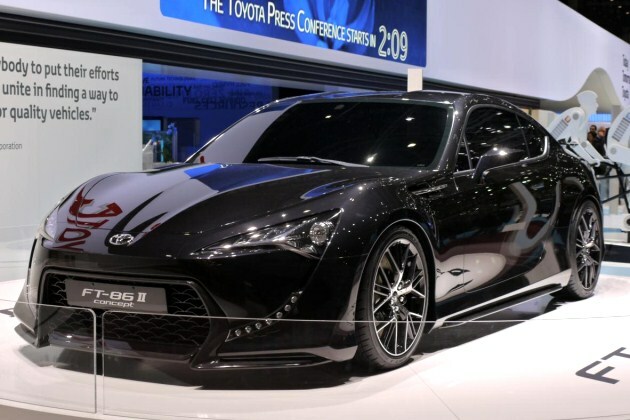 As one of the more hotly anticipated debuts of the Geneva Motor Show, we were sure to aim the lenses of our DSLRs in the direction of the Toyota FT-86 II Concept, which, as you're surely aware by now, previews a new rear-wheel drive sports coupe that's due to enter production in 2012. Needless to say, we're looking forward to an actual production model, but in the meantime, at least we get to gaze on an exterior shape that Toyota says "gives the clearest indication yet as to the final design of Toyota's next sports car" with "aerodynamics developed from F1 technology." Good thing that got something out of their lackluster F1 efforts. There's very little information in the way of hard specs, but we'll get more of those soon enough when Subaru shows off its own version of this rear-wheel-drive sports car, which was jointly developed by the two automakers. What we do know is that the concept and future production cars will use a 2.0-liter four cylinder boxer engine mounted up front and driving the rear wheels through a manual gearbox. For the full details, check out the press release after the break, and be sure to scope out our high-res image gallery of live photos below. Geneva 2011: Toyota FT-86 II Concept is one step closer to production originally appeared on Autoblog on Tue, 01 Mar 2011 04:50:00 EST. Please see our terms for use of feeds.